What keeps you awake at night? We asked IT security professionals the same question and found that these issues are top of mind: malware and spear phishing, securing mobile devices, employee security awareness and new technologies that detect threats capable of bypassing traditional signature-based defenses. In previous years cyberattacks were on a steady and alarming rise. 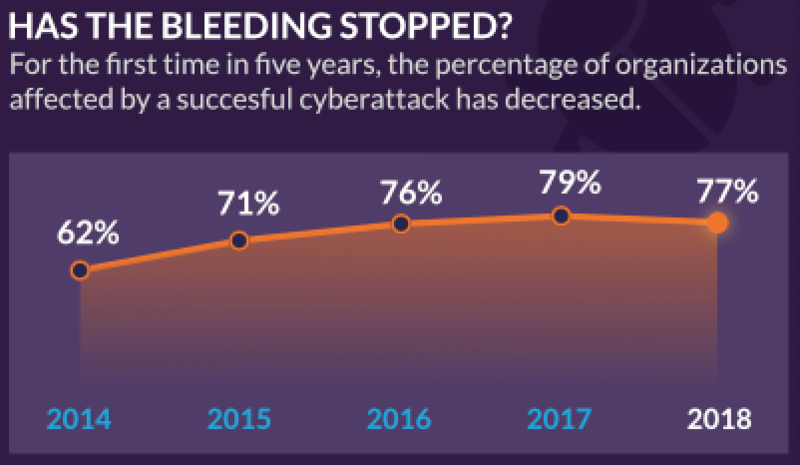 But now, data shows a year-over-year decrease in organizations being hit by at least one successful attack – down from 79.2 percent to 77.2 percent. Yet there are still plenty of obstacles and challenges security teams need to overcome. A lack of skilled IT personnel is at the top of the list. So too is low security awareness among employees and the escalating crush of data. The top three motivations for organizations investing in user and entity behavior analytics (UEBA) technology include the ability to detect account hijacking, privilege access abuse and defend against insider threats. Enterprise security teams are beginning to realize that what they’ve done in the past is steadily losing ground to advancements by today’s threat actors. A renewed effort and investment is needed to move forward with an integrated security solution. Despite security deployments such as WAFs, database firewalls and data encryption, online organizations still need help keeping their data safe. Mostly they’re looking to improve blocking threats (58 percent) and improve detecting threats (51 percent). Other popular options include improving detecting threats, reducing unwanted traffic and improving enforcement of usage policies. IT security continues to evolve as data and application breaches grow. For security teams getting in front of threats is key. Early detection, traffic analysis, forensics and customizable policies can make the difference for organizations to change its security posture from being reactive to being proactive. For more information, download the full 2018 Cyberthreat Defense Report at www.imperva.com/go/cdr.